The Burke Museum is a research and   PORT HADLOCK,                      and admission . 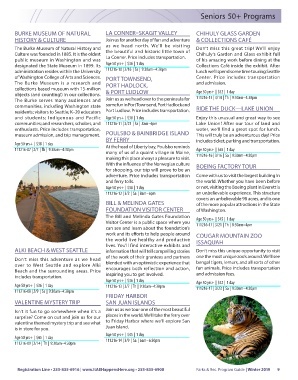 residents; visitors to Seattle; K–20 educators   Port Ludlow . Price includes transportation . enthusiasts . Price includes transportation,                            water, we’ll find a great spot for lunch . BY FERRY                            includes ticket, parking and transportation . making this place always a pleasure to visit . FOUNDATION VISITOR CENTER           of Washington . Beach and the surrounding areas . Price   encourages both reflection and action,   and admission fees . includes transportation . inspiring you to get involved . is in store for you . Juan Island .